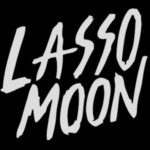 Lasso Moon is an amalgamation of two Liverpool bands Broken Men and Sankofa and “Kimota Codeine” is their first single, coming out towards the end of January. The press release describes it as a love song to codeine, but I’m not buying in to that. The minimalist arrangement in the verses of drums and a picked guitar line (and the black and white one-shot, static video) hint at pathos, desperation and addiction rather than any joyous high. Codeine’s an opiate painkiller and highly addictive; this is about addiction to oblivion and shutting out the world. The song and the video show a bleak world where there are no highs or lows, only monotony, and codeine is a desperate attempt to shut that world out, however briefly. None of this is a criticism of the song, which evokes this twilight world perfectly, with downbeat verses and choruses which are marginally more positive. Combined with the video it creates a stark vision, where the illness is only slightly worse than the cure. “Kimota Codeine” is released on Friday January 27th.